From the “better late than never department” comes proof via ANSYS that a 2 psi difference in football inflation has a negligible effect on the ball’s gripability. ANSYS and the University of Stuttgart have partnered on providing access to CFD on HPC. Screen capture from an ANSYS video illustrating negligible grip changes due to ball inflation. Click image for video. See article link above. 3Dconnexion introduced the 3-button CadMouse [which should also be good enough for meshing and CFD]. The T-Splines v4 plugin for Rhino is now available. RealFlow 2015 is coming soon – here are a few sneak peek videos. Voith designed the new linear jet marine propulsion system exclusively on the computer using CFD. Flow Science published FLOW-3D News for Winter 2015. SIGGRAPH 2015 will be held 9-13 August 2015 in Los Angeles. Austria’s Graz University of Technology invites applications for an Endowed Professorship in CFD. GE seeks a CFD Engineer for their facility in Turkey. Autodesk announced that all new commercial seats of their stand-alone desktop software will be licensed by a subscription model as opposed to perpetual licensing. This has nothing to do with the cloud. CD-adapco revealed the list of accepted presentations for the STAR Global Conference 2015 (San Diego, 16-18 March). Learn more about the Dr. Mesh Genius Award at this event where you get 2 hours to write a macro for STAR-CCM+. Coming in STAR-CCM+ v10: adjoint-based mesh adaption. Image from CD-adapco. Click image for article. Add this to your “to read” list. On the SolidWorks blog you’ll find The History of Engineering Design Tools. Engineering 3.0 (1985-2015) which gave us 3D CAD, simulation, and PDM. Engineering 4.0, the so-called “next engineering paradigm,” is presented in terms of a recorded video and infographic. What does Van Gogh’s Starry Night have to do with turbulent flow? Watch this 5 minute TED-Ed video to find out. 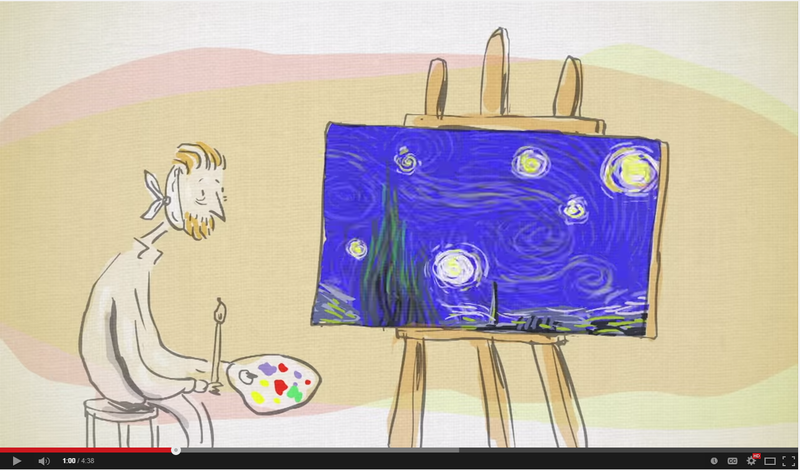 Screen capture from a video that relates Van Gogh’s Starry Night to the turbulence in a fluid. This entry was posted in Applications, Events, Hardware, News, Software and tagged ANSYS, CD-adapco, FENSAP, Flow Science, FLOW-3D, jobs, Newmerical Technologies, Onshape, RealFlow, Rhino, SIGGRAPH, SolidWorks, T-Splines. Bookmark the permalink. I used to work at a company that used 3Dconnexion CAD mice. They looked really cool, but no one could figure out how to use them and so most engineers who had them used them as paperweights. We support their 3D mice in Pointwise and many of the folks here love them. Left hand for pan/zoom/rotate, right hand for pointing and clicking. But this new CAD mouse looks like your regular mouse. I’ve got the page bookmarked and am thinking about maybe getting one for myself.